RH CORSTORPHINE skipper Pete Steindl is set to return as the bottom side in the CSL Eastern Premiership make an important trip to Myreside to tackle Watsonians tomorrow. The performances of the men from East Barnton Avenue have improved in recent weeks and last Saturday Daniel Payne hit a cracking 125 not out as they nearly saw off Autoecosse Forfarshire. However, as it stands, they are still winless in the league and, with just five matches left to play, time is running out for them to stay up. Watsonians are directly above them in the table with two wins so that makes tomorrow’s match even more important. As well as Steindl, Ozzie Malik also returns to the RHC team with Arnie Sathiy and Nicky Brunton dropping out. So far this term, the two sides have met twice with Watsonians notching up wins in the league and the Scottish Cup. Elsewhere in the top flight tomorrow, leaders Mazars Grange host Autoecosse Forfarshire in Stockbridge. For that match, Harris Aslam returns for the home side having starred for Scotland under-19s as they reached the World Cup last week. 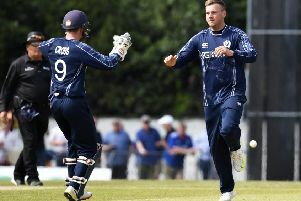 Former Scotland man Neil McCallum is also back while there is a slight doubt over the fitness of key bowler John Blain. Carlton are third and will be keen to get back to winning ways at home to Stoneywood-Dyce. Skipper Gordon Drummond is back for the Grange Loan men as is Rory McCann. To cap off a busy day in the Capital, Heriot’s have Sean Weeraratna back as they take on Falkland at Goldenacre. In the Baillie Gifford ESCA Championship, second-placed SMRH welcome third-placed Carlton II to Inverleith in what should be a cracker. Edinburgh host leaders Glenrothes while, in East One, third placed Heriot’s II host Gala.